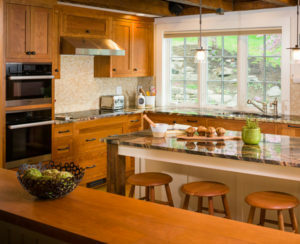 Gilberte Interiors, Inc. Unforgettable Country Escape - Gilberte Interiors, Inc.
Over the years, this quiet and relaxing Vermont home grew to be a gathering spot for family and friends. As the children have grown and moved away, the couple who own the house have spent more time establishing lush gardens and creating a wonderful setting around the place. Realizing that the house itself needed attention, they turned to Gilberte Interiors, with whom they had worked on numerous projects. They began by sitting down with Cheryl to establish a project overview, which led to a comprehensive design outline and plans. Gilberte Interiors created the working plans that detailed all the lighting, plumbing, finishes, and final furnishings. 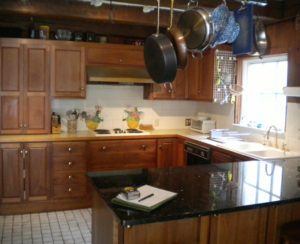 Cabinetry and built-ins were all designed by Gilberte Interiors, with local craftsman selected to fabricate them. Removing some existing walls and moving others created more open spaces for the family to gather. 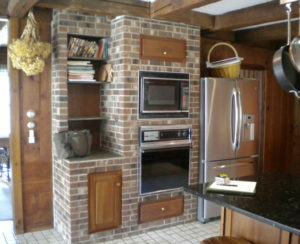 A larger window area was added in the kitchen, and, with the removal of a brick center wall, this once dark and closed-in kitchen was transformed into a light, spacious nucleus of the home. One of the most striking elements is the stone counters, which became the centerpiece of the space. Cheryl combed local quarries and suppliers in search of stone with a unique balance of color and grain. 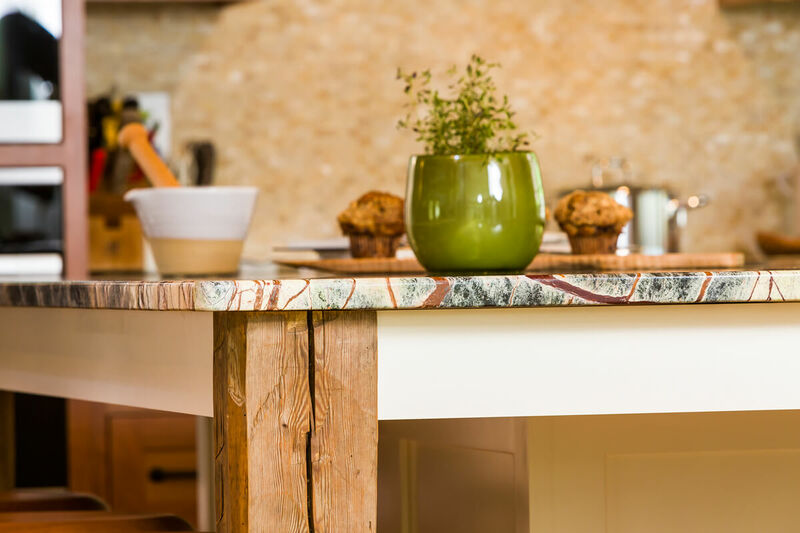 By first measuring and creating a template for each finished counter top, the Gilberte team was able to match the design to the materials and select which slabs to cut from based on how they would appear in the finished home. The result is both stunning and exquisitely “natural” feeling. When the floors were leveled out, Cheryl selected wide-plank hickory wood with a distinct character, again giving an element a life of its own that meshed with the greater design. 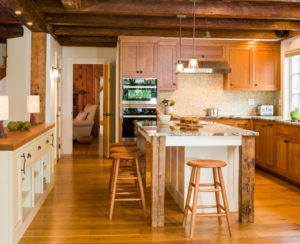 The new layout gives the house an open and fresh feel, while letting the textures of old beams and natural woods shine. As the gardens are integral part of the experience, exterior views were taken into account in almost every decision. 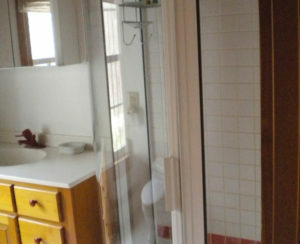 Opening up the master bedroom and relocating the bath also allowed for a more comfortable space. Access to a loft above the bedroom was changed from a ladder to an architecturally interesting stairway, which allows the space below to be divided and shared between the bedroom bookshelves and bathroom storage. As new furnishings, materials, and lighting were selected, it was important to continue this quest to combine a fresh, updated feel with natural, handcrafted detail. Window treatments, bedding, and furniture upholstery, replete with custom details, were all fabricated in Gilberte Interiors workrooms. Large, two-inch-thick plank wood was handpicked so its live edge could be highlighted as part of a floating counter in the bathroom, with the remainder incorporated into a custom-forged, iron-and-wood media console. Finally, riverstone tiling was added below the new soaking tub, creating yet another visual link between interior and exterior spaces. The dust now settled from the construction and the furnishings in place, the home is now an even more valued place for enjoying family visits and gardens that inspire.